Wyandotte County – Page 1539 – Welcome to Wyandotte Daily! Today’s forecast is partly sunny with a high near 45, according to the National Weather Service. It will be windy, with a north northwest wind of 10 to 18 mph, gusting as high as 28 mph, the weather service said. 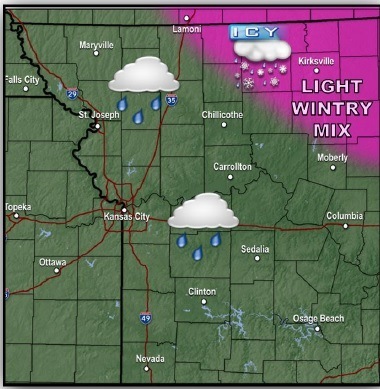 A winter storm is to the east of the Kansas City area, according to the weather service. Tonight, expect a low of 31 with mostly cloudy skies, according to the weather service. Wednesday’s high will be near 56, with mostly sunny skies and a southeast wind of 5 to 9 mph, the weather service said. Wednesday night, expect a low of 42 with an east southeast wind of 6 to 10 mph, according to the weather service. Thursday’s temperatures will reach 69, with mostly sunny skies, the weather service said. A south wind of 11 to 16 mph will increase to 19 to 24 mph in the afternoon, with gusts as high as 32 mph, according to the weather service. Thursday night, expect a low of 53. Friday, it will be sunny with a high of 68, the weather service said. Saturday’s high will be near 66, and Sunday, near 58, according to the weather service. The Wyandotte County Extension Master Gardeners are sponsoring “Colorful Shade Gardening: Beyond Hostas,” from 11:30 a.m. to 1 p.m. Thursday, March 3. Rob Mortko, known as “the hosta guy,” and owner of Made in the Shade Gardens in Olathe, Kan., will be sharing his expertise, as he discusses the many options to create balance and diversity in the shady landscape. He’ll cover the different degrees of shade as well as the seemingly endless number of plants which are ideally suited for the shade. The class will be held in the Sunflower Room at the Wyandotte County Extension Office, 1208 N, 79th St., Kansas City, Kan., 913-299-9300. Fee: $5, payable at the door. Registration is not required. Many government offices are closed today for Presidents Day. The Unified Government offices are closed and will reopen on Tuesday, according to an announcement on the UG’s Facebook page. The Board of Public Utilities offices are also closed today and will reopen Tuesday, the BPU announced on its web page. Today is a federal holiday, with federal offices closed. However, today is not a state of Kansas holiday. The Kansas Legislature is scheduled to meet today. Trash will be collected as usual today and this week by Deffenbaugh, according to its website. There will be no delay because of the holiday. Today is a postal holiday and residents will not receive mail today. Also, many banks are closed today. The public schools in Wyandotte County and Kansas City Kansas Community College are not in session today because it is a holiday.